"Global Warming is happening, but that doesn't mean we can't try to stop it." 44 BC: Julius Caesar survives assassination attempt. 410 AD: Romans repel King Alaric I. 1010 AD: Albinus Gordian is elected Emperor and begins a new age of environmentalism in the Roman Empire. Global Warming is happening, but that doesn't mean we can't try to stop it. Aer Mutatio: How Environmentalism Fixes The Roman Empire has not been tagged yet. Help others find Aer Mutatio: How Environmentalism Fixes The Roman Empire by tagging it! 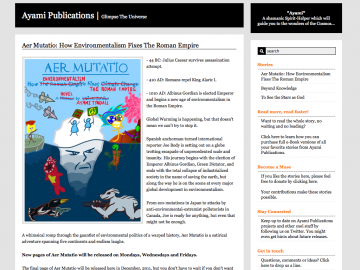 Aer Mutatio: How Environmentalism Fixes The Roman Empire has not been reviewed yet. Aer Mutatio: How Environmentalism Fixes The Roman Empire has not been recommended yet.